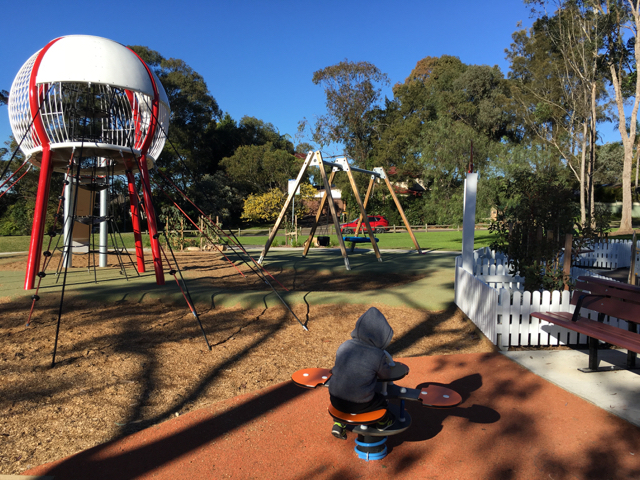 The Golden Jubilee Field playground located on Esk Street next to the Golden Jubilee fields in Wahroonga in Upper North Shore in Sydney was recently upgraded and completed in April 2017. This cute playground features an interesting 'baseball' looking climbing structure which leads to a nice long slide with rubber soft fall areas around the slide and swings. There is a four-way rocker, a junior swing seat and a large nest swing for little ones to swing about too! The main feature of this cute playground is its 'Tiny Town' where small children can have some fun pretending they are in a little town of their own, play inside the little houses and play panels and meet new friends. Kids can bring along their scooter and scoot through the town and wave hello as they pass by the areas. Little Mister loved this little town, we will have to bring his sister there soon. I can just imagine them playing hide and seek and let their imagination go wild in this fun little town. There are no toilets or cafés in the area or water fountain so be prepared and take some snacks or a picnic with you to make most of the trip and this little playground amongst a quiet residential area. There are no shade sails however council has planted trees which over time will provide natural shade. However they have advised to be sun smart. There is no fencing installed around the playground because its location is set back from the road. It has a nice pathway around the playground so bring the bikes/scooters for a stroll or the dog too for a walk but be mindful that dogs should be kept 10 metres away from the playground. Free parking is located the street along the playground. Enjoy!